Play contributes to the learning, development, and well-being of children. Play offers an ideal context for engaging with others in meaningful and mutually beneficial interactions. Play also promotes participation in natural environments in ways that advance learning and development. Early experiences that promote increasing complexity of play provide a foundation for future friendships, participation, and learning. Children with disabilities, however, play less often and use less complex play than their peers. 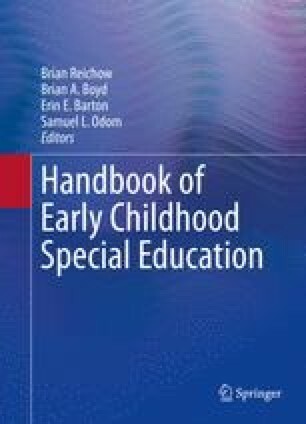 The purpose of this chapter is to provide an overview of the intervention research related to increasing play skills in young children. Implications for research and practice also are described. This chapter is dedicated to two individuals who shaped how I watch children play, how I research play, and how I think about play—Mark Wolery and Karin Lifter. I am forever grateful for their guidance and support.